Trumpeter, composer and arranger Freddie Hendrix, originally from Teaneck, New Jersey, has worked his way steadily during the last couple of decades to achieve his current position within the top echelon of first-call musicians whether it be as a jazz soloist, lead trumpeter or section player within a big band. His latter skill is borne out by his repeat employment with the archetypal ‘swing machine’, the Count Basie Orchestra which he re-joined in 2010 having left at the end of 2007 to work with pop star and actress Alicia Keys for her 2008 'As I Am’ world tour, performing 105 shows in over 30 countries. His versatility is evidenced by working with the best in the business as a member of the 'ChopHorns' horn section along with Ray Chew and the Crew at the BET Honors in Washington, DC from 2009-2013. On this annual BET Honors show, this house band has backed up celebrities consisting of the legendary Aretha Franklin, Stevie Wonder, Smokey Robinson, Mary J. Blige, Alicia Keys, etc.. The list is endless. Recent performances consist of The Jimmy Fallon Tonight show with Steve Wonder and the Jimmy Fallon House Band for Jimmy's Birthday in September of 2014. Again with Aretha Franklin at Radio City Hall 2014 and most recently for her Birthday in March 2015. Freddie's also performed for two presidents as well! Once at the White House for President Obama and his "Red, White, and Blues" PBS special in February 2012, and for former President Bill Clinton in May 2014 at Ginny's Supperclub, NYC. Other noted performances have been with the virtuoso bassist Stanley Clarke for his 60th birthday celebration at the world famous Blue Note Jazz Club in New York, and as a special guest to the alto sax sensation Steve Wilson’s 50th birthday bash at The Jazz Standard, NYC Possessing a Bachelor and Masters degree in music performance, Freddie’s jazz credentials are extensive! His experience include performances and recordings with The Grammy winning Christian McBride Big Band, Dizzy Gillespie All-Star Big Band, The legendary Jimmy Heath Big Band and Quintet, (VJO) Vanguard Jazz Orchestra, George Gee Swing Orchestra, Wynton Marsalis and the Jazz at the Lincoln Center Orchestra, Roy Hargrove Big Band, Nicholas Paytonʼs TSO (Television Studio Orchestra), Frank Foster's Loud Minority Big Band, the legendary Illinois Jacquet Big Band, Mike Longo Big Band, Rufus Reid Quintet/Nonet, Billy Harper Quintet, Dr. Lonnie Smith, Bobby Watson's Horizon Band, Mulgrew Miller's Wingspan, Oliver Lake Organ Quartet, Organist Melvin Davis, T.S. Monk Sextet, Cecil Brooks III CB3 band, and the David Krakauer/Fred Wesley group 'Abraham Inc'. 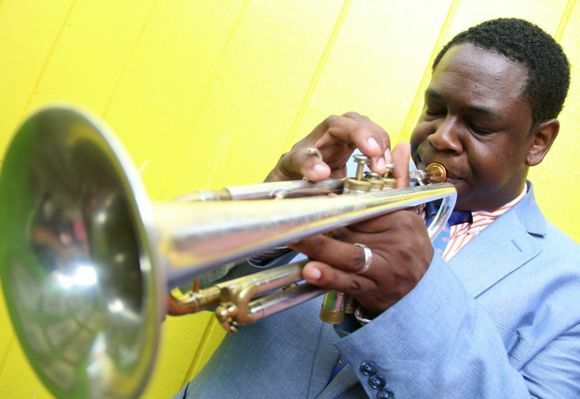 Above all, Freddie has emerged as one of the music’s exciting players – an amalgam of the great trumpeters such as Freddie Hubbard, Woody Shaw, Lee Morgan and Clifford Brown. A charismatic personality displaying a sure-footedness in his full toned phrasing and sense of swing. His versatility and superb holds its own in a variety of settings, from R&B, pop and jazz. His upcoming CD release as a leader is entitled '' Jersey Cat"